Thank you to all who came to celebrate Thimbles 12 year anniversary. What fun we had. Many prizes and drawings for the event….congratulations to those whose names were drawn….and we have our challenge….I’m anxious to see what everyone comes up with. We don’t have long to wait as they must be completed by August 15th. I’ll post and share them in August. Summer just wouldn’t be summer without lemonade and if you’ve been saving salvages now is the time to bring them in and we’ll play. If you don’t think you have enough…. no worries as I have a tote full and would love to share. You can make a fun lemonade runner or I’m working on a watermelon runner I’ll share next week. They’re fun and quite addicting. 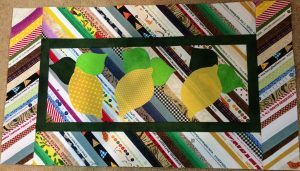 So if you want to learn what salvage quilting is all about we’ll be having a class on Saturday, July 29th. Contact the shop to sign up. No cost for the class but you will need to bring supplies or purchase when you arrive. 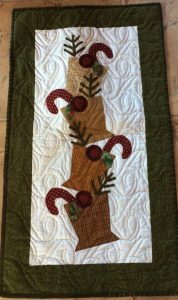 It’s never to early for winter projects and here’s a fun wall hanging I just completed We have kits. If you have the scrap crazy template and don’t know how to begin this is the class for you. We’ll be making snowmen. You may purchase a kit we have or select other prints. Class is scheduled for Saturday, August 12th. Contact the shop to sign up. The art gallery Gypsy & The Frog at the end of hall in my building are hosting a book signing event this Saturday, July 22, 1-3 pm. The book is called “The Me Only I Can Be” written by LeAnn Petterson and illustrated by Mary Kay Latzka (owner of the gallery). They’ll also have music and Rich will have his pottery wheel outside in the back. Should be fun so if you get a chance swing by. Ready for some “free” fabric? Well come see me. Starting Tuesday (July 18th) running through Saturday (July 22nd) purchase 6 yards of regular priced fabric and receive a yard of sale fabric, your choice, “Free”. 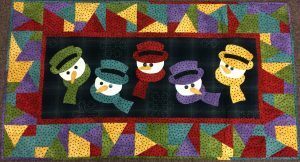 The 6 yards must be 1/2 yd minimum cut or more and a total of 6 yards must be purchased in one purchase in order to qualify. Fat Quarters, remnants and kits do not qualify.